Experience a peaceful woodland getaway at ‘The Golden Retreat,’ a 3-bedroom, 3-bath vacation rental cabin in beautiful Maggie Valley. Hosting 6 with 1,800 square feet of comfortable living space, this lovely cabin is perfect for families or friends seeking a relaxing retreat. Soothe your cares away in the hot tub, marvel at the mountain views from the spacious decks, and explore the unique surrounding areas of this magnificent home! Vaulted ceilings, wildlife decor and numerous windows meet your eyes as you enter the home. The open concept floor plan blends the living area, dining room and kitchen, making it easy to entertain and spend time with your loved ones. Curl up on the recliner or couch in the living area, which features a lamp with a log base, a wooden table handmade out of tree logs, a wood-burning stone fireplace and a mounted flat-screen Satellite TV. Kick back and relax while the chef of the group prepares a tasty meal in the kitchen behind you. The kitchen is fully equipped with everything you need to prepare your favorite recipes. Once your meal is ready, gather around the homey wooden dining table to enjoy your meals with the whole group. If you prefer an al fresco dining experience, step out onto the spacious deck and sit around the patio table for dinner with a view. For a casual meal, fire up the Weber charcoal grill and enjoy a memorable cookout with the mountains as your backdrop. After dinner, sit back with your favorite beverage on the outdoor swing. Admire the natural views while catching up with your travel companions. Named the ‘Golden Retreat’ to reflect the way the adjacent enclosing ridge catches the evening sun, this home ensures stunning sunsets, which you can easily enjoy from any of the decks. Once the sun has set, head down from the deck to access the 4-person hot tub, which does require a mandatory fee. At the end of each exciting day, you’ll be happy to retreat back inside for a good night’s rest. Downstairs, 2 bedrooms offer a TV and queen-sized beds to curl up in. The third bedroom also features a queen-sized bed and TV and is upstairs where the loft is. The loft overlooks the living room, and features a cozy living area with comfy couches, creating the perfect spot for reading a book on a rainy day. Along with it’s amazing views and comfortable amenities, one of this home’s best features it its spectacular location! Enjoy the mountains, ski Maggie Valley, hike to waterfalls, and go golfing or kayaking, all while staying at this ideally-located home. From the cabin, you’ll be 25 minutes from Asheville, where the opportunities for dining out, shopping and entertainment are endless. Visit The Grove Park Inn in Asheville, an all-rock hotel built in the early 1900’s, where there is live music every night in the lobby, occasional dancing, and great dining - certainly a sight to behold! Visit the breweries and bars in Asheville, and if you’re there on a Friday night around 6 PM, enjoy the drummers, who gather to make wonderful rhythms for hours. One of the most popular locations in the area is The Biltmore House, which is an old grand home built 100 years ago. Take the tour and admire the history and beauty of this magnificent home. Outdoor enthusiasts will love visiting Cataloochee, where you’re sure to spot elk, bears and more wildlife! If you love the outdoors, you’ll also want to check out the numerous hikes, including ‘The Devil’s Courthouse,’ which is a ¼ mile hike straight up with wonderful views, ‘Water Rock Knob,’ which is about a half mile straight up with spectacular views, and East Fork of the Pigeon, which is a longer hike that ends with a waterfall. Another fantastic hike is ‘High Shoals Falls,’ which is a trail at South Mountains State Park, about an hour and a half minutes from the home. Take a trip to Cherokee to experience The Living Village, the museum, where you’ll learn interesting history of the Cherokee Tribe, or test your luck at the casino! Gatlinburg and Pigeon Forge are also about an hour hour west on I-40. Visit these popular towns to enjoy an abundance of shops, restaurants and endless entertainment! Dollywood with its numerous rides and shows is also a fun place to visit with the whole family! For rafting and tubing, check out The Pigeon River, which is right in front of the house, the Tuckasegee River in Cherokee, Sliding Rock, or the Nantahala, which is about an hour away on 74 West. Additionally, the home is just 10 minutes from Waysneville, where you’ll find casual dining at The Sweet Onion and The Tipping Point, and many other dining choices, including Botticelli’s, Ferraras, Angelo’s Pizza and The Chef’s Table! - Great location - 10 minutes from Waynesville, 25 minutes from Asheville, and easy access to Pigeon Forge, Gatlinburg, Dollywood, and outdoor activities, like rafting, hiking, tubing, golfing, kayaking and more! 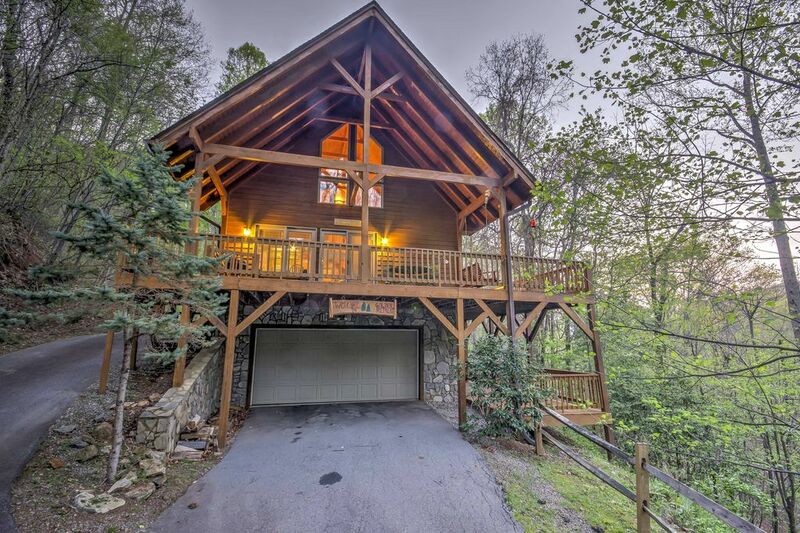 The idea of a luxury cabin in the Smokies was invented with the "Golden Retreat" in mind. If 10 stars was available, I would rate it an 11. Every interaction I had with the staff was prompt, professional and efficient, not to mention extremely pleasant. I just can't recommend Evolve Rentals or the Golden Retreat cabin enough. We will definitely stay there again. I can't say enough about our entire experience. A nice mix of Relaxing and lots to see and do. We stayed 4 night and could have stayed longer. This cabin is absolutely wonderful. We were traveling on motorcycles and I was worried about the lane to the cabin. I did ask 3 times if it was paved and was told yes. Well, it's not completely paved, just a very short jot was gravel but it was pretty firm and stable with some bumps. The cabin is just a 2-3 min drive from US 19. It was difficult trying to find it as GPS wasn't reliable. The challenging part was the steep grades and narrow roads made it difficult to turn around on bikes. But once we found it we didn't have any problems. The cabin lane is steep and i wouldn't recommend MC travel in the fall because the leaves would make the lane slick and it is pretty good climb. We almost had a slide off. Our recommendation to make things easier is to have it marked as there are no house numbers at the bottom of the lane or where it splits for the 2 cabins sharing the main lane. After arriving, only one person had spotty service, just enough to call to get the wifi codes. It wasn't posted anywhere in the house. They need a magnet created and stuck on the fridge. We pretty much had everything else we needed, shampoo, conditioner, soap, TP, papertowels, dishes, pots and pans, spices, other condiments people left behind. We didnt use the condiments but what we had purchased, we left behind, including enough alcohol for a small party. :) We had arrived late and it was getting dark. There are no grocery stores there in Maggie Valley on the strip. Walmart was 12 miles away on the interstate. And, liquor stores close at 7 or 9, dont recall, but it was early. You can get beer and wine much later at the Shell gas station. There was a shortage of towels and wash clothes. For our bathroom we only 1 wash clothe, the others had 2. If you wanted in the hot tub and take a shower the same day, you had to do laundry, or use a wet towel. The cabin is pretty roomy. Each bedroom is on its own floor, stacked on top of each other, each with their own full baths. We really enjoyed this feature as we were traveling with friends. There is deck furniture, and a radio that takes CDs. The radio reception was horrrible. Bring CDs. We didn't watch TV so I'm unsure of that. Now, the hottub. A much needed feature after riding 10+ hrs on the bike. Nice. Loved it. But a lot of the jets didn't work. Also the skimmer was broke and kept floating away when the jets were off.